Mike Nelson scares me. His installations are claustrophobic and isolating and while no one thing in the elaborately constructed spaces is particularly frightening (clown masks aside), it’s the immediate convergence of all the things that produces an overwhelming intense experience. And I can’t get enough. I feel like I shouldn’t be in one of Nelson’s rooms, touching and opening doors, searching my way through the maze (not in the literal dark but the tension is just the same). The sense of something being off is palpable and yet, during this feeling of disorientation, I feel totally within my element. Like a good horror film, I feel both displaced and engrossed, enjoying not knowing my way and appreciating the sensory overload provided to me. Indeed, Nelson’s work has a lot in common with the aesthetics and structure of horror cinema such as his employment of architecture and interiors, particularly in the usage of a succession of rooms. I could only wander, stop, and stare when encountering his Studio Apparatus for Camden Arts Centre… (1998/2010) at Camden Arts Centre’s now closed exhibition Never the Same River (Possible Futures, Probable Pasts). Consisting of three rooms (dirty entrance walkway and a small reception/office room that led to the larger backyard object extravaganza. In an attempt to focus, record, and re-live the experience I just wrote down all I thought I saw: selection of motorcycle helmets with raccoon takes; slices of science fiction mags; fake flames; slouched body with paper bag head; log fire with face shield, fur, gas cans, wood planks and concreted blocks; space constellations of hubcaps, wire, and balls; latters; antlers; Mickey Mouse with devil antlers; chicken wire; humming radio; fabric mountains; the list goes on. Each new work I encounter of Nelson’s is a new adventure. I have a long road of discovery ahead when it comes to his work and I’m looking forward to the journey. Mike Nelson will be representing Britain at the 54th Venice Biennale this summer. 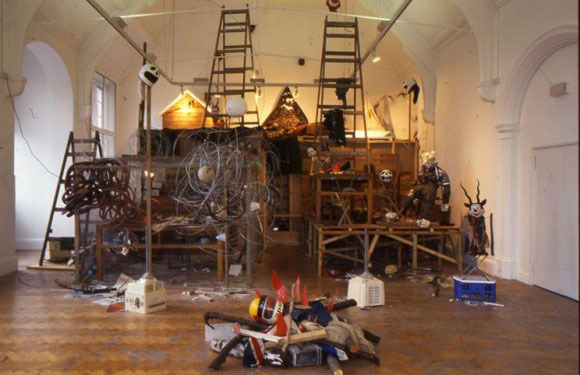 Image is from Camden Arts Centre, courtesy of the artist.